defun(HaP) is the latest piece of the HaP cycle in which I have been working since the Autumn of 2007. This piece is final work of the HaP series closing it by giving a definition of itself. In all the HaP pieces there is a source musical work taken as model from which to derive material. In this piece, there is no preceding work, the Aria is taken as source giving the starting point for a series of “incestuous” variations. Some of the techniques in musical derivation used in preceding pieces and documented in my Master’s thesis, are present here among new ones. Also, some of the live electronic tools used before are here in some sort of farewell appearance. The surviving ideas and spirit from the HaP cycle are present to give a logical conclusion of them. 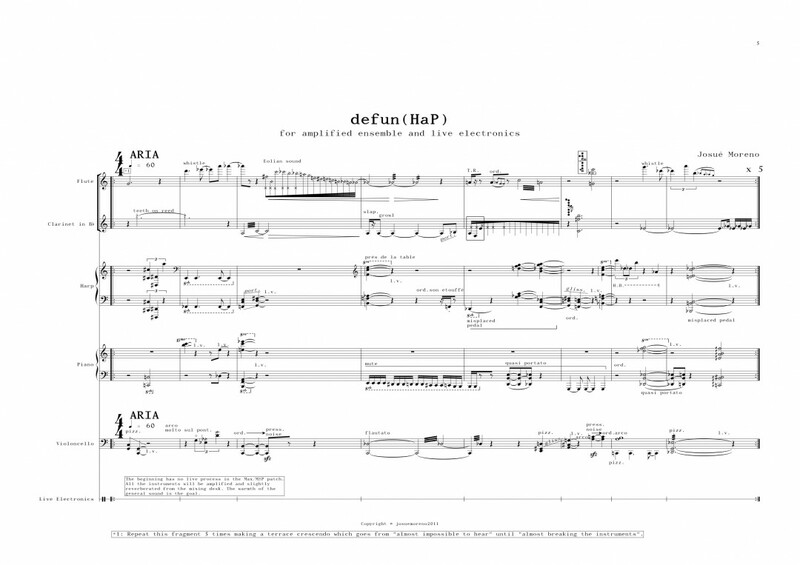 I am very glad that defunensemble gave me the opportunity to write this work to be premiered at the SibaFest 2012, to give an impression of who I am and where am I in this moment at the institution and country that have witnessed my musical evolution during these recent years is extraordinarily meaningful to me. Also, it is a pleasure to write music for such a group of gifted professionals. Even though I have to thank the efforts and trust from defunensemble and Sami Klemola, I would like to dedicate this piece to Andrew Bentley. Thanks to him, my musical conceptions have gone far beyond what I could have imagined and thanks to his views and work in collaboration with Kalev Tiits, provided to Sibelius Academy, Finland and the rest of the world a Music Technology Department so unique where the highest technological and artistic results are possible in a free and generous environment.